"Landree Brotherton has been interested in politics for as long as he can remember. However, his first leadership position resulted from being at the right place at the right time. Brotherton recalls, “Our county party saw the need for a Young Democrats group and began the process of creating one. I happened to see the ad in the local paper and decided I would go to the meeting. A couple meetings later, I found myself as the treasurer of the newly minted Hamblen County Young Democrats.” During the 2004 election cycle, he knocked on doors, stuffed envelopes, put up yard signs, and worked the polls for a local Assessor of Property race and for State Representative John Litz. From that point on, Brotherton was hooked on politics. As a Freshman at Tusculum College, he and a few friends founded a chapter of the College Democrats, was elected Vice President of the Chapter, and later served two terms as President. Brotherton also became involved with the Tennessee Federation of College Democrats (TFCD) and was twice elected as the TFCD Membership Director on the State Executive Board. During the 2005 Hamblen County Reorganization, he was elected to the Executive Committee, and in 2006, Brotherton served as an intern for Harold Ford, Jr.’s Senate Campaign in Northeast Tennessee. He also worked extensively with Rick Trent, the Democratic nominee for Congress in the 1st District. During the 2008 election cycle, he served as campaign manager for Rob Russell, 1st District nominee for Congress. He also managed the Hamblen County Democratic headquarters and worked tirelessly to elect Barack Obama. Brotherton believes he has the energy and the enthusiasm to make a difference in our county by engaging a younger generation of Democrats in the party in various ways. He points to the dedicated core of party activists in Hamblen County as the base upon which to build the party and notes that they don’t “hesitate to embrace change or younger folks coming in.” Though he admits that their weakness, like that of many other county parties, is fundraising (especially given the current economy), he stresses that the Executive Committee is very creative and has already begun working on a number of fundraising ideas. Brotherton also mentioned the new county Democrat web site here. (Note: I did see mention of this story on PostPolitics in Nashville too.) Brotherton is also writing the Hamblen Democrat page on the state web site as well. First some news and then a tribute to one of the great character actors to ever hit the screen. A Twitter comment from actress Felicia Day caused a mini-storm with a claim the new Joss Whedon show "Dollhouse" was about to be canceled. It is not - though Fox has no love for Whedon's work, the episode Day was in was not meant to be aired but will appear on the already planned DVD set. Of course, since Fox is prepping the set may well mean all we'll get is one season. Holding any decent ratings on a Friday night is tough - but the show is absolutely better and better each week. "My take is this: If "Dollhouse" is canceled, for the love of all that is holy, creator Joss Whedon should get out of business with the broadcast networks. "Whedon needs to make his next show on cable. End of story." Speaking of odd TV decisions, I did watch the season finale of "Life On Mars", as ABC decided to cancel it abruptly. The writers created an ending for the series, which was vastly different from the way the original BBC series ended. The story of the show was about a policeman who is injured in the present and wakes up in 1973 working as a cop there too. He blends right in with everyone, he's trying to figure out what the heck happened and in the last episode he wakes up from a cryo-sleep chamber on a spaceship about to land on Mars. All the folks in his "dream scenario" were his fellow astronauts. That had to blow a few minds of viewers. When the DVD of this show comes out, it's worth a view, plus it has some absolutely fantastic music from the early 70s. And it has Gretchen Mol. Here's the most recent nominee for Terrible Ideas for a Remake - Tom Cruise and John Travolta want to remake "Butch Cassidy and the Sundance Kid". Two new comedies on the way look very promising. In fact, the response to just the trailer for the new comedy "The Hangover" has been so strong they are already working on a sequel. It's from the director of "Old School" and the preview does show great promise. Check it out here. 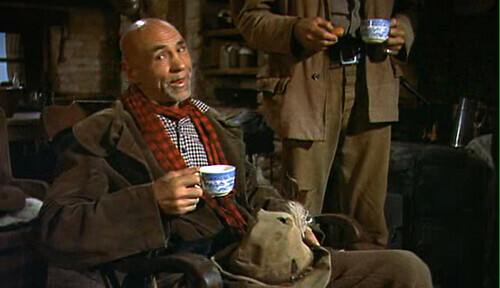 No other actor has a resume as diverse as Hank Worden. Born in 1901, he turned to acting after a short run as a rodeo rider - in fact some 25 years after he left the circuit and was already a regular in the movies, a doctor notified him that his neck was broken from a fall off a horse during the rodeo days. Most often, he played cowboy roles, usually in B-features, but when he made friends with director John Ford, he became a staple in all of Ford's westerns. He's likely most famous to movie fans for the role of Mose Harper in the classic "The Searchers". His character goes somewhat mad in the head after an Indian attack and longs for just a rocking chair and a roof over his head. But his dialog and his unusual style of halted speech transforms him into a near-Shakespearean character, a jester who dispenses wisdom and warnings. As with many character actors in the early 60s, he moved into television work and the list of actors he worked with is astonishing: Brando in "One-Eyed Jacks", Clint Eastwood on "Rawhide", just to name a few. In TV, he was often on "Daniel Boone", "Green Acres", "Bonanza", and "Knight Rider", just to name a few. And he kept plowing away - his face, his voice, his mischievous eyes and grin were unforgettable. One TV role I remember was an episode of Rod Serling's "Night Gallery". It was a short bit, about a hippie who winds up in Hell, and Hell turns out to be a single room, with a jukebox playing an annoying song over and over. And there in the corner, in a rocking chair, is Hank Worden, droning on and on about odd stories, like the winter the "baby got the croup", or what he's been reading in the Farmer's Almanac. And Worden kept making movies - he's in the very awful "Sgt. 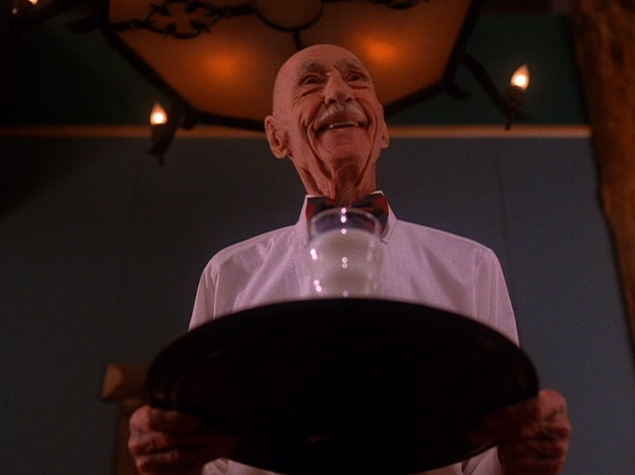 Pepper's Lonely Hearts Club Band", "Every Which Way But Loose," "Runaway Train" -- and he concluded his career on "Twin Peaks", during the second season where he played a waiter in 4 or 5 episodes (see image below). Who else can boast a career like that? Hank died in 1992 and The Movie Morlocks blog at TCM has a great post about his career you can read here. In tough economic times, it's pretty easy to call for the populace to be angry - it's a sport about as challenging as shooting fish in a shot glass. The recent media-induced frenzy (spurred by the FOX News network) however is another opportunity for the angry to show off how little they understand their own nation's history. "Let's recap. It began with the on-air rant from the floor of the Chicago Mercantile Exchange by the Coward Rick Santelli -- "coward" because he's apparently too afraid to go on The Daily Show and, instead, Jim Cramer went on and took a beating for something that Santelli basically started. Nevertheless, according to one of the official tea bag websites, Santelli is credited as the patron saint of the movement. Unfortunately, I doubt they'll listen. Last week, with crocodile tears streaming down his punch-me face, Glenn Beck urged his viewers to: "Believe in something -- even if it's wrong. Believe in it!" The loopy sure seem to hate America - or as Jon Stewart says, being in the minority for a mere 10 weeks is not the definition of tyranny. More bloggers today take up the NYTimes tale I wrote about yesterday about how one investment bank, Morgan Keegan, was allowed to be both sales force and underwriter for municipal bonds issued across the state (and in other states too), in a world-class example of conflict of interest and how it has damaged communities and individuals. And the fiction writers at the TNGOP claim it was all Gov. Bredesen's fault -- despite the fact that the process which gave MK the approval to work they way they did was passed by the state legislature in 1999, with unanimous votes in both the House and the Senate. Bill Hobbs and crew might want to bone up on some history and recall that Republican Don Sundquist was governor at that time. Communities like Claiborne County and Lewisburg, TN are finding out the investment advice they received from the Memphis-based Morgan Keegan is costing them far more than they bargained for. Today's NYTimes published a report today on how the firm has been working the state as educator, advisor, and investor all with state approval. "The municipal bond marketplace was so lightly regulated that in Tennessee Morgan Keegan was able to dominate almost every phase of the business. The firm, which is based in Memphis, sold $2 billion worth of municipal bond derivatives to 38 cities and counties since 2001, according to data compiled by the state comptroller’s office. Representatives of Morgan Keegan pointed out that they saved cities and counties money for years by delivering lower interest rates, and that the economic decline that created the turmoil in the bond market was beyond their control. Moody’s credit rating agency on Tuesday issued a negative outlook for the fiscal health of municipal governments." "Unlike most states, Tennessee was one of the few where the legislature passed a law intended to regulate the sale of these complicated municipal bond derivatives to local governments. But the profusion of those deals and the various roles of Morgan Keegan have left leaders of those cities and counties furious at both the firm and the state. In Claiborne County, north of Knoxville, officials said they were recently told by Morgan Keegan bankers that extracting themselves from a municipal bond derivative would cost $3 million, a sum the poor county cannot afford. “I told the Morgan Keegan man here in my office, ‘It seems to me, you are all trying to slip paperwork by us like a small, shady loan company,’ ” said Joe Duncan, the mayor of Claiborne County." "Municipal bond experts say they know of no other state where a firm was allowed to wear three hats; several states prohibit a single firm from acting as both adviser and underwriter. In Pennsylvania, which has such a prohibition, federal prosecutors are investigating accusations that investment banks and financial advisers conspired to sell bonds with inflated fees to school districts. Mr. Ayres denied that the firm had a conflict in advising municipalities and underwriting bond derivatives. He said that Morgan Keegan had taught the seminar at the request of the state and that they had offered unbiased descriptions of municipal bond options. He added that the firm had not marketed products during the sessions." "Earlier this year, Claiborne County officials were told by Mr. Overman that they had only a few weeks to refinance an $18 million bond or pay a quadrupled quarterly payment of $700,000. Mr. Overman declined to comment for this article. In Lewisburg, after Mr. Overman pitched the swap idea for the sewer project, Kenneth E. Carr, a city official, attended the class. “The seminar was dull and boring,” said Mr. Carr, who still has a copy of the book, stamped with the state seal of Tennessee on every page. “I thought, ‘Well, this is approved by the state because they put their seal of approval on it." "One industry source said that level of activity, coupled with the fact that there may be more than 100 pending arbitration claims related to the RMK issue, means Morgan Keegan has still spent several million dollars so far defending itself against the claims, not counting the awards on behalf of claimants. In Stoltmann’s recent case, he said the Fitzgeralds were brothers who inherited family money and were looking for safe, conservative investments. "The Financial Industry Regulatory Authority ordered the Memphis-based company to pay a San Francisco-based investor all losses plus interest and court costs, said Chicago-based arbitration lawyer Andrew Stoltmann, who handled the case. The award – which is the largest arbitration award against Morgan Keegan’s bond funds as of late – set a precedent for pending arbitration lawsuits against the company, Stoltmann said. The “tide has turned” in favor of the plaintiffs because it has been established that 10 percent to 15 percent of the funds were being misclassified as safer investments, Stoltmann said." More on the story from Enclave and from KnoxViews and this NYTimes blog. Additionally, for the 16th consecutive year, Morgan Keegan dominated municipal bond underwriting in the South Central U.S. The five-state region includes Alabama, Arkansas, Kentucky, Louisiana, Mississippi and Tennessee. Serving as senior manager on 219 issues with a par value of $4.9 billion, the firm’s market share in the region jumped from 15 percent in 2007 to 24.8 percent in 2008. Morgan Keegan was also the leading municipal bond underwriter, in terms of number of transactions, in the Southeast and Southwest regions of the country. In the 10-state Southeast region that includes Virginia, the firm senior managed 226 issues with a par value of $5.6 billion." The new Republican majority in Tennessee's legislature, aided by some Democrats as well, have been hard at work to make sure a person who has a permit to carry a gun can do just that when they go out to eat. Who knew going out for a bite to eat had become an exercise in danger? The state House voted 70 to 26 to allow folks to carry their weapons into an eatery that serves alcohol - as long as they don't consume any alcohol. Just exactly how will owners determine if someone who orders a drink or two is carrying a weapon? Will diners have to take a lie detector test? Maybe they'll just have to pinky swear. Who voted vote for the new law? Representatives voting aye were: Barker, Bass, Bell, Borchert, Brooks H, Brooks K, Campfield, Carr, Casada, Cobb C, Cobb T, Coleman, Coley, Curtiss, Dean, Dennis, Dunn, Eldridge, Evans, Faulkner, Ferguson, Fincher, Floyd, Ford, Fraley, Hackworth, Halford, Harrison, Hawk, Haynes, Hensley, Hill, Johnson C, Johnson P, Kelsey, Litz, Lollar, Lundberg, Lynn, Maddox, Maggart, Matheny, Matlock, McCord, McCormick, McDaniel, McDonald, McManus, Montgomery, Moore, Mumpower, Niceley, Odom, Ramsey, Rich, Roach, Rowland, Sargent, Shepard, Shipley, Swafford, Tidwell, Tindell, Todd, Watson, Weaver, Windle, Winningham, Yokley, Mr. Speaker Williams -- 70. Representatives voting no were: Armstrong, Bone, Brown, Camper, Cobb J, Cooper, DeBerry J, DeBerry L, Favors, Gilmore, Hardaway, Harmon, Harwell, Jones S, Jones U, Kernell, Miller, Naifeh, Pitts, Richardson, Shaw, Sontany, Stewart, Towns, Turner L, Turner M -- 26. Just what was the critical problem this new law resolves? At the least, you might think the Legislature would create some method for making sure that people who have a court order to hand over their weapons after being cited with an order of protection. Sadly, such a program does not exist. HB 2081 by Towns: Firearms and Ammunition - As introduced, authorizes persons over 65 to obtain a gun carry permit without having to complete a handgun safety course. - Amends TCA Title 39, Chapter 17, Part 13. *HB 2157 by Towns: Firearms and Ammunition - As introduced, waives handgun permit fees for persons over 65. - Amends TCA Title 39, Chapter 17, Part 13. HB 0489 by Tidwell: Criminal Offenses - As introduced, allows person who has permit to carry a handgun to carry gun in place where alcohol is served for consumption on premises if person is not consuming alcohol or is not otherwise prohibited by posting provisions. - Amends TCA Title 39, Chapter 17, Part 13. HB 0521 by Rich: Firearms and Ammunition - As introduced, allows persons with handgun carry permit to carry in public parks, public postsecondary institutions, and restaurants where alcoholic beverages are being served; allows judges and district attorneys to carry firearms where law enforcement can carry if they have permit or appropriate training. - Amends TCA Title 39, Chapter 17, Part 13 and Title 70. *HB 0798 by Campfield: Firearms and Ammunition - As introduced, authorizes full-time faculty and staff at public colleges and universities in Tennessee to carry handguns if not otherwise prohibited by law. - Amends TCA Title 39, Chapter 17, Part 13. *HB 0960 by Tindell: Firearms and Ammunition - As introduced, authorizes person with handgun carry permit to possess firearm in local, state, or federal parks. - Amends TCA Title 39, Chapter 17, Part 13 and Title 70. *HB 1395 by Evans: Firearms and Ammunition - As introduced, prohibits employers from prohibiting persons possessing a handgun carry permit from transporting and storing a firearm out of sight in a locked vehicle on any property set aside for vehicles. - Amends TCA Title 39, Chapter 17, Part 13. HB 1781 by West: Firearms and Ammunition - As introduced, restricts information required to be submitted by a participant in a handgun safety course and corrects reference to federal law; requires that documents required to be submitted for purchase of firearms that must be registered be executed by chief law enforcement within 15 days of request. - Amends TCA Title 4; Title 36, Chapter 3; Title 39; Title 40, Chapter 35; Title 45; Title 57; Title 58, Chapter 1 and Title 58, Chapter 2. SB 0554 by Norris: Firearms and Ammunition - As introduced, deletes requirement that the purchaser of a firearm give a thumbprint as part of background check process and that the TBI furnish thumbprint cards and pads to firearm dealers. - Amends TCA Title 39, Chapter 17, Part 13. HB 1801 by West Handgun Permits - As introduced, provides that "handgun carry permit" may be used interchangeably with "weapon carry permit" where applicable, thereby imposing any rights or duties that apply to persons with a handgun carry permit to persons who carry a lawful weapon. - Amends TCA Title 39, Chapter 17, Part 13. "Senator Ketron claims he introduced the bill to “protect and purify” the ballot. And it will do just that - but not in the American “this is a democracy and we should be removing barriers to voting instead of creating them” kind of way. As Senator Haynes said, we already have laws in place to punish those who commit voter fraud. Why do we need to erect additional barriers. Especially, I would add, when the incidences of voter fraud cases is virtually non-existent? "Opponents claim Sen. Ketron’s legislation will somehow discourage voters from participating in the political process and unnecessarily stigmatizes those who would have to obtain a free photo ID by signing a pauper’s oath. By that reasoning, the federal government shouldn’t issue EBT cards for food to the needy because it identifies them as being poor. Indeed, honest, open elections are the best protection society has against those who would try to subvert and steal political power." So, voting, backbone 'o Democracy, depends on yet another ID, apart from the one you get when you apply to register to vote under existing state rules. And these new IDs are somehow linked to getting food stamps. Bottom line: voters cannot be trusted. Nor can the poor and needy. "In 2008, the Tennessee General Assembly passed bi-partisan legislation that would require optical scanning voting machines for all 95 counties in the state by 2010. Governor Bredesen signed it into law in June of ’08. But now that the Republicans have taken control of the General Assembly and in turn will have the majority members on the County Election Commissions, and will also have the ability to replace the current Democrat Election Administrators in 95 counties with Republican Administrators, they want to stall the purchase of verifiable voting machines until 2012.